I heard as long ago as 2003 that trying to call a cell phone while it's inside a microwave (with the microwave off, of course) could be used to test if the shielding of the microwave was intact. I recall trying it and that it worked (the phone did not ring). I've tried in other microwaves and it has sometimes worked. This claim appears fairly common: See WikiAnswers, WikiHow, and ABC News. Why or why not? Currently, explanations mostly occur in forums and none are well-supported. So using Bluetooth / WiFi is a very good test for seeing if the microwave oven has a leak. The ping is a very good test, since what you really want to see is if any microwave comes out, so even if the laptop within the oven, say, can receive the request, the reply (ECHO_REPLY) should not be sent. Cellphone frequencies vary a lot. Within GSM there are various frequencies and CDMA is different so using cellphones is not a good test for this. The shielding is based on the wavelength of the wave which is inversely proportional to the frequency. The wavelength of a wave can be correlated to the size of it if it were a particle. Now for the shielding to work the holes in the shielding material should be smaller than the wavelength of the waves. So, while a Cell phone microwave frequency being much lesser than that of WiFi / Bluetooth, the wavelength of Cell Phone microwave is much bigger than WiFi / BlueTooth. So it is easier to block cell phone microwaves than it is to block WiFi / Bluetooth so if you find a cell phone signal to be blocked in the microwave, the smaller wavelength ( higher frequency ) WiFi / Bluetooth signals may not be blocked and hence the similar frequency microwaves in the oven may actually not shielded properly. While the answer from @manojlds was reasonable, I wasn't satisfied. The key question is not whether the seals on a microwave can be tested using Wifi at the same operating frequency (2.4GHz), but whether a cell phone is an accurate way of testing these same seals. In other words, will something that filters out 2.4GHz also filter out 900-1800MHz? Where where f is the frequency of the field and fc is the cut-off frequency of the opening. 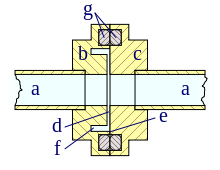 The cut-off frequency is approximately the frequency at which the maximum height or width, a, is equal to a half-wavelength. d is the depth of the opening. I took this to mean that if all other characteristics about the shield are kept constant, decreasing the frequency will increase the attenuation -- perhaps an effective shield for 2.45 GHz really isn't an effective shield for lower frequencies. So... not quite the definitive answer I hoped for, but reasonable. Anyway, that's 36 dB of attenuation (a 1/4000 factor) Assuming a 700W microwave, the power leaking out is 175 mW. A 19"x12" door is 1470 cm^2, so roughly, the power leaking out is 0.1 mW/cm^2. Health limit is 1 mW/cm^2, so the leakage is 1/10th of that. This is a really rough experiment, but you can see the leakage is safe. Not the answer you're looking for? Browse other questions tagged mobile-phones microwaves diagnostic-test . Do Samsung phone batteries contain secret chips and antennae for stealing data?